Get more fire out of your firewire? 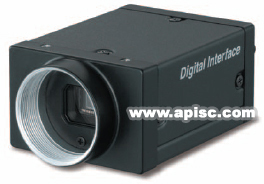 with Sony's first IEEE 1394.b digital camera with fast frame rates and 14-bit output. Sony's new XCD-V50 monochrome digital camera incorporates a 1/3 type progressive scan CCD with square pixels that produces high-quality VGA (640 x 480) images transferred via a high-performance IEEE 1394.b interface. This ultra-compact camera supports cable lengths up to 100 meters and has the ability to daisy-chain multiple cameras on a single run. Plus the XCD-V50 features two screw cable connectors for a more robust performance compared to standard cables. And best of all, the XCD-V50 is backward compatible with conventional 1394 via IIDC 1.31 support. With a variety of convenient features such as an external trigger input for the capture of fast moving objects or still images in low-light environments, and selectable video modes, the XCD-V50 is ideal for image processing and analysis as well as printed circuit board, bar code and bottle inspection applications.